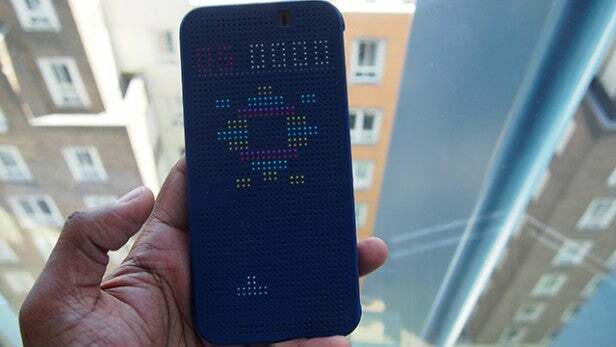 What is the HTC One M9 Dot View case? The Dot View case is HTC’s official folio-style case specifically designed for the One M9. Like last year’s One M8 Dot View case, it features the same perforated cover to display notifications in a retro, dot matrix UI. HTC has now added a raft of new case colours and more functionality such as the ability to play games, use live themes and control music playback. It’s still pricey at £35 and while it provides good protection, it’s still not an essential accessory for One M9 owners. The Dot View look is largely the same as last year. The harder plastic cover clips onto the One M9’s metal back leaving space for the charging port and headphone jack. 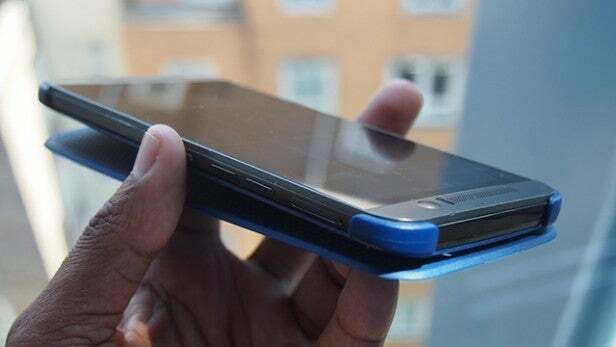 It also leaves the camera sensor exposed so you can take photos without taking the case off. 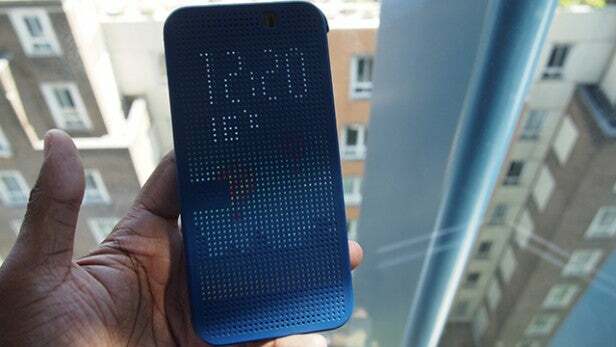 HTC also offers some Dot View cases with a transparent plastic back, although having used both kinds, it’s certainly the cheaper-looking of the two options. The second part is the soft-touch plastic flap, which sits over the screen and uses a similar magnetic technology to Apple’s smart iPad cover to automatically wake up the phone’s screen when lifted. The dot matrix-style holed design is still there with the small HTC logo halfway up the case plus a cut out for the microphone so you can still take calls. Covering that gorgeous aluminium body with a layer of plastic still feels very odd to us, but it’s not particularly chunky and offers decent everyday protection. 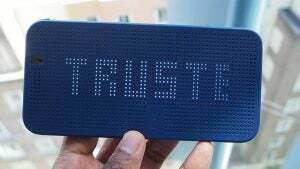 While it seems like a reasonably rugged and well built case, a fellow Dot View case user has found that the spine wears away quite badly after less than month’s use simply sitting inside their jeans pocket. While we’ve not encountered the same problems, we do have some of the same niggles as we had with last year’s model. It’s still tricky to take photos with the rear camera, especially for landscape images just because of how flimsy the lid is. That lid also leaves smudges on the screen, so you’ll need to give it a good wipe down every now and then. You can grab it in a multitude of colours with a choice of both loud and low key options. The grey and blue versions we tried certainly sit in the second of those categories, but if you want something a little louder, then there’s Candy Floss and Turquoise to choose from as well. One of our biggest issues with the Dot View case is that it wasn’t all that useful. It’s still largely based around notifications and the gesture support but now those notifications are a little more customisable. To set up Dot View preferences you’ll need to head to the Personalize section in the phone settings menu. Here you can decide how long the Dot View display remains turned on, which notifications can be viewed and the ability to bypass the security screen. Notification support now extends to Facebook, Gmail, Google+, Hangouts, Skype and Twitter. There’s also a new Themes section following HTC’s decision to introduce a similar feature to the latest version of Sense. You can pick from around 30 themes, which include five holiday themed ones and a series of live animated themes options. You can also create your own from photos in your gallery. Not all images work well, so it’s good to keep things simple. A very purposeful double tap on the front of the case or pressing the standby button will display the time and current temperature on the dot matrix display. If someone has sent you a message on Facebook and you haven’t already spotted it, a big app icon will appear on the front of the case. You can now swipe left or right on those icons to see multiple notifications or swipe up to open it. You will however still need to open the case to view those messages. One of the best new features is the music playback support. Whether you’re using Spotify or HTC’s own music application, media controls appear on the case including track names letting you swipe to skip tracks and turn the volume up with a swipe. 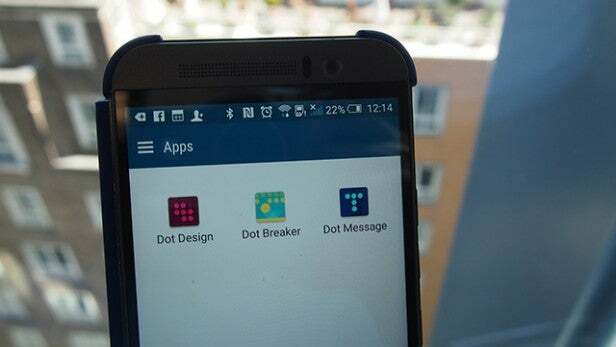 This time around, HTC is also adding two new apps you can download for free from Google Play that support the Dot View and expand its uses. Once you’ve installed them both, they’ll appear inside the Dot View menu within the settings. The Dot Design app lets you sketch your own themes, whether it’s a free sketch using existing templates or doodling over your own smartphone pictures. Similarly, there’s a Dot View message option where you choose words instead of images to appear across the front of the Dot View case. Dot Breaker is where you get to have some fun. Here you can play a version of the classic Breakout tilting the phone to move the paddle. You can pause and resume although playing this game uses the highest brightness display setting so it will put a dent in battery life. The Dot View still feels a little gimmicky but in its latest guise it’s a lot more fun. There are more ways to personalise and if you like your themes you’re well catered for. The notification support has improved and we really like the addition of the music control support. The design still throws up some issues. It’s still very difficult to view notifications in bright sunlight and it still gets in the way of taking photos. 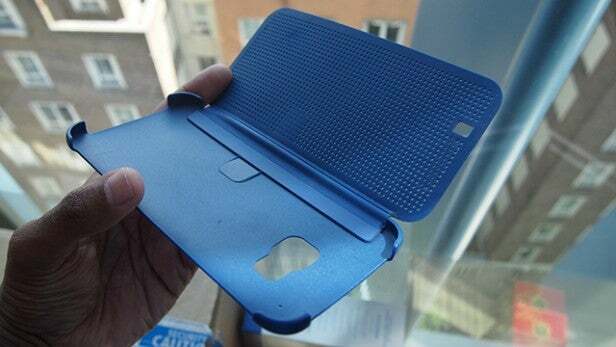 Better third party support would help justify what is still a lot of money to spend on a phone case. Shop around and you can get it for close to £25. If you liked the idea of the Dot View case last year, and you’ve bought the One M9, then you’ll appreciate the new features. Thanks to Mobile Fun for providing us with the Blue Official HTC One M9 Dot View case used in this review. The post HTC One M9 Dot View case appeared first on Trusted Reviews.